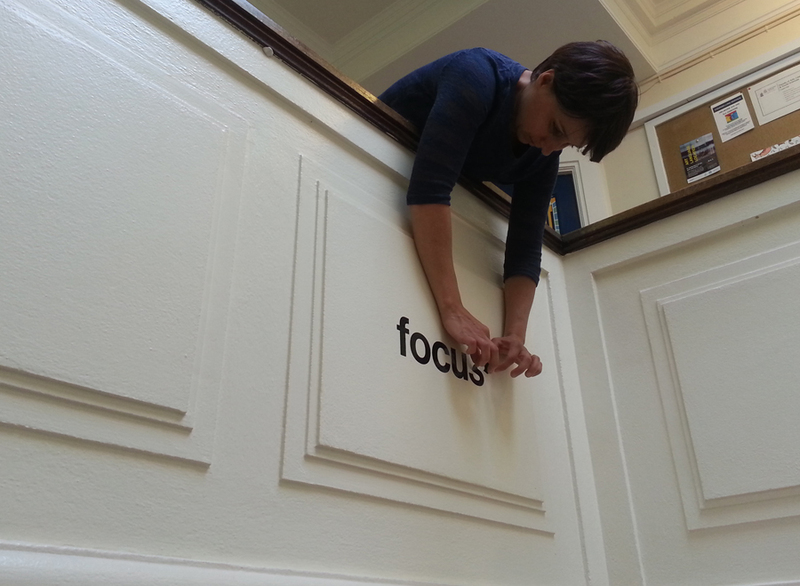 With the exhibition just over a month away we are getting towards the business end of proceedings, and our focus is turning to matters of implementation and installation, so it was a very appropriate choice of wording that AnnaMaria Kardos chose when she visited Cambridge again today for a trial installation of her site-specific work that will adorn the corridors of power at Anglia Ruskin University. [Note also our lovely flier in the background on the noticeboard, courtesy Peter Sutton‘s tireless design work for us]. We shall be updating our website over the coming weeks with full details of artworks, locations and our programme of events and performances. So watch this space, and in the meantime, many thanks to Benet Spencer and Daniel Jagger from ARU for permission to locate AnnaMaria’s work in a perfect, if slightly tricky, spot.